A high performance tanning solution with innovative non streak techology that has been specifically developed to provide a gorgeous natural colour while helping to tone protect and moisturise skin. 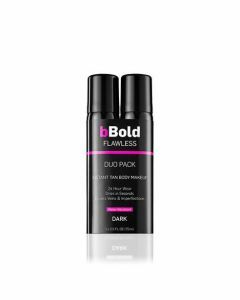 B Bold Tan Liquid 200ml combines a unique blend of specially selected ingredients that work together to give you a natural streak free tan. Aloe Vera extracts help tone, protect and moisturise skin while antioxidants produced by Vitamin E help combat signs of premature ageing. Wax 48 hours before tanning and shave 24 hours before to allow your skin to recover and your pores to close. Exfoliate thoroughly 24 hours before tanning. Exfoliation removes dead skin cells from the skins outermost layer and helps to ensure even coverage on application. After exfoliating moisturise your skin. Shower 30 minutes before application. This will enable your skin to return to its natural PH balance and allow time for your pores to close. Using a tanning mitt, apply the tan to the skin receiving the benefit of instant colour on application. Wait 2-5 minutes until your tan is dry before getting redressed. Wear loose dark clothes until your tan is fully developed.